We live in a two-bedroom apartment, and with a curious toddler, it soon became apparent that it’s oh so important to keep things accessible yet out of reach for little hands. Also, with the limited space, I find that clutter builds very, very quickly. Over the course of the past year or so, I’ve slowly picked up containers and organizational devices which have really helped out. Scouring the dollar bins at Target is usually a good place to stop, and eventually I went straight into the organization/container aisle at Target and picked up some crucial items by Itso. I also try to keep boxes or baskets which are either cute or usefully sized and try to find a use for them. Here’s an example of an Itso container system – a black box with a shelf and three canvas bins which fit nicely inside. They hold my candles and supplies for Shabbos, havdala, Chanukah, etc. On top is a purple box which originally contained something from Bath and Body Works (I think), and now it holds our bentchers. Everything is accessible, but out of sight. These are some throwbacks. 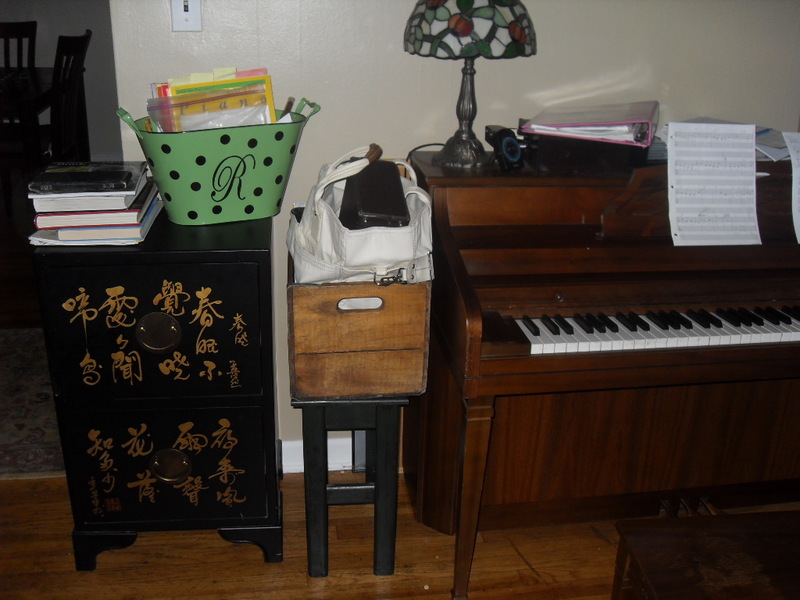 The wooden crate keeps piano books and my clarinet up off the ground, and the “R” bin, which was originally a gift basket, makes a very nice holder for more piano books. Most importantly, little man can’t get into the books. This hook saves much space in my small kitchen. 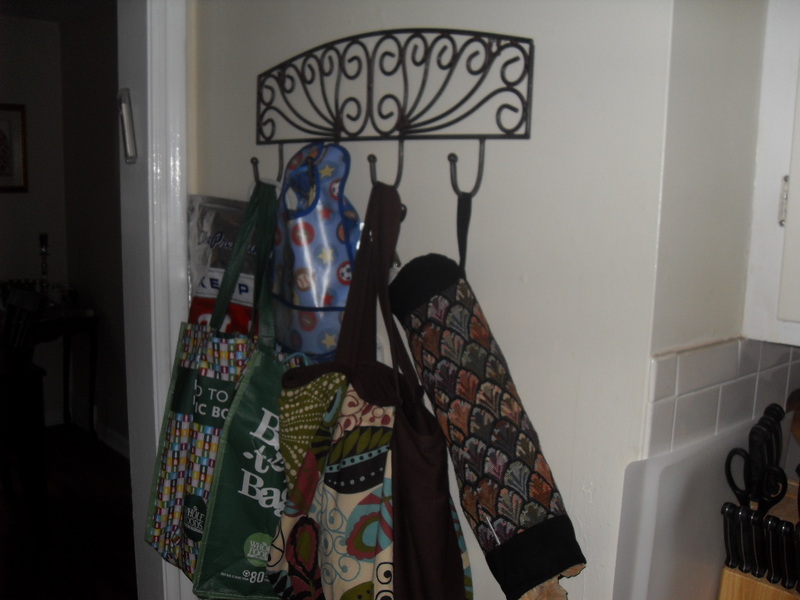 It holds shopping bags, bibs, aprons, my purse, our keys and the plastic bag saver. Talk about efficient! And it’s cute, too. Little man’s bottles and sippy cups used to find homes most anywhere. That wasn’t working for me, so when I found this white metal bin at Target in the dollar bins (it was actually $2.50), I put it to good use. Now everything is centralized. Wheee! 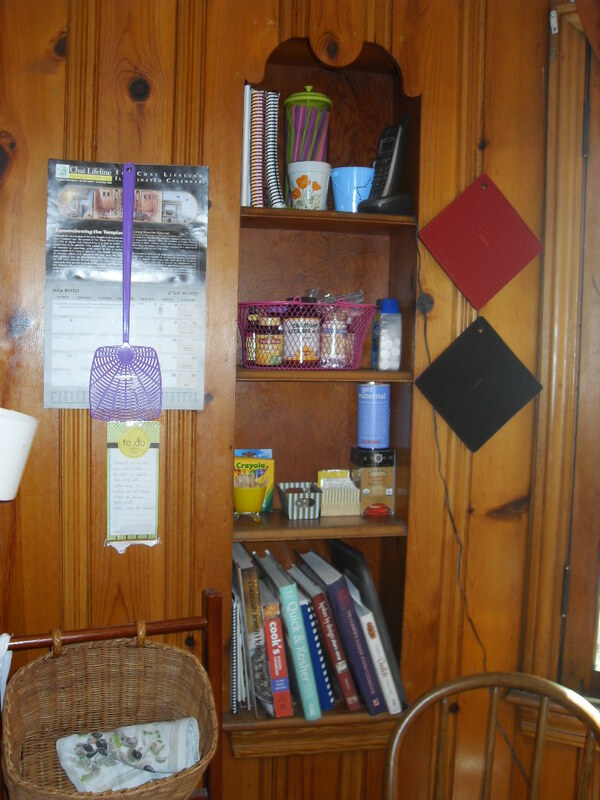 There is a great built-in bookshelf in the kitchen which I’m constantly reinventing to maximize the usefulness. This is the present incarnation. There are little flowerpot containers on the top shelf which hold cell phone and hands-free devices. Next shelf down is a basket for vitamins. Down from there are a few smallish containers which hold toothpicks, and jewelry for when I’m washing things and need to take off bracelets and rings. This shelving unit is the most useful thing in my entire house. Seriously. It was a bookshelf for me in college, but since I have limited surface space in the kitchen, I transformed it into the mega-holder that it is now. 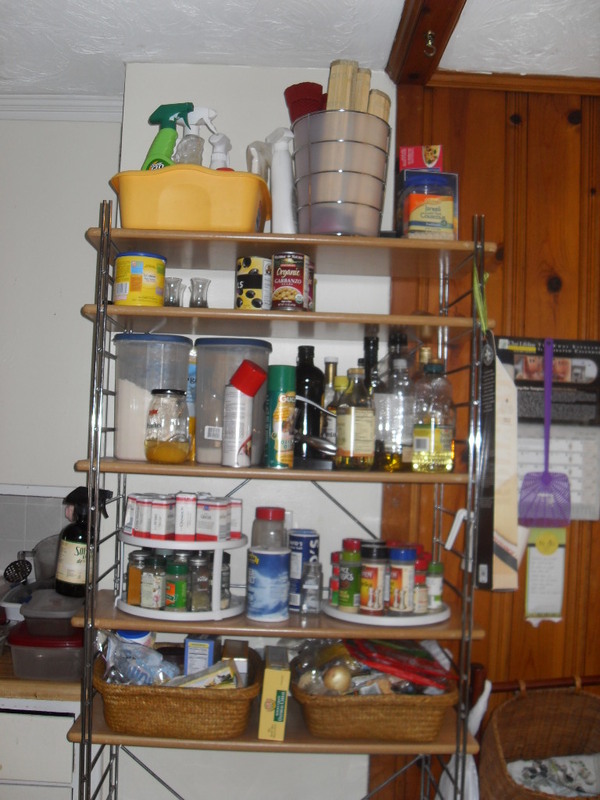 Cleaning supplies, place-mats, dry goods, oils and vinegar, spices, baby snacks. Its got ’em all. 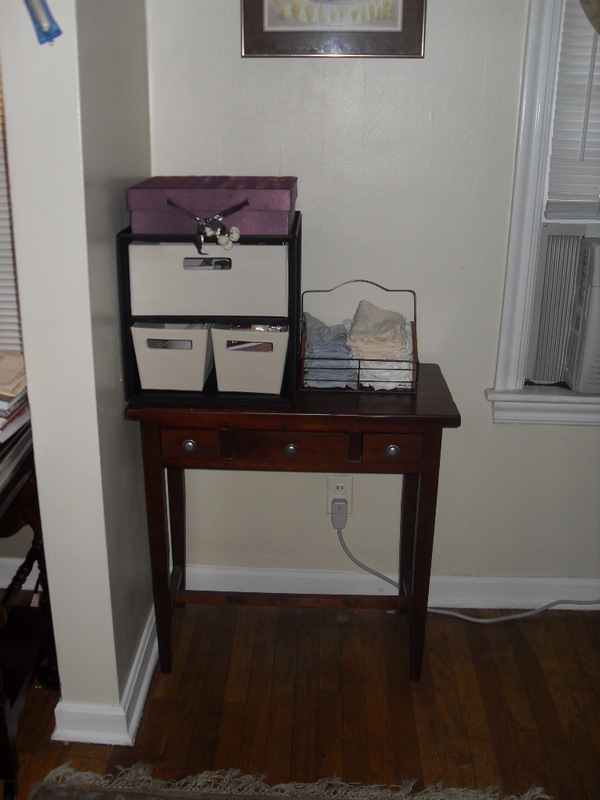 Those are just a few examples of ways I made a small space more functional and organized, at little to no cost. 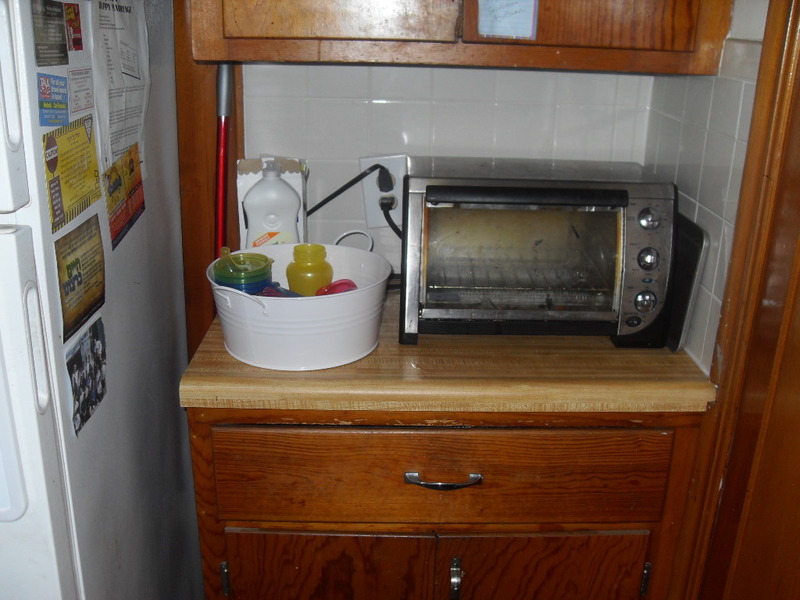 It’s more about how to use what I already have in the house and to get the most out of the space which is accessible. We’re also in the process of making the house more storage-friendly. We picked up these great cabinet units, also at Target, for about $30 a piece. It’s got 4 sturdy shelves (plus the top) and two doors with handles, so it can be baby-proofed easily. If you need more shelf space, I highly recomend it. It became our pantry, as we have no pantry space in the kitchen. I think the brand is ClosetMaid, and they make a variety of different shapes and sizes for shelves, drawers and bookcases, all for a really good price and extremely simple set up.